A corner of the Preble County Courthouse was opened on Tuesday, July 24, and a time capsule was removed from inside. That time capsule has been there since the courthouse was built, nearly 100 years ago. New items will be placed inside and the capsule will be replaced during a ceremony on Sunday, Oct. 6. 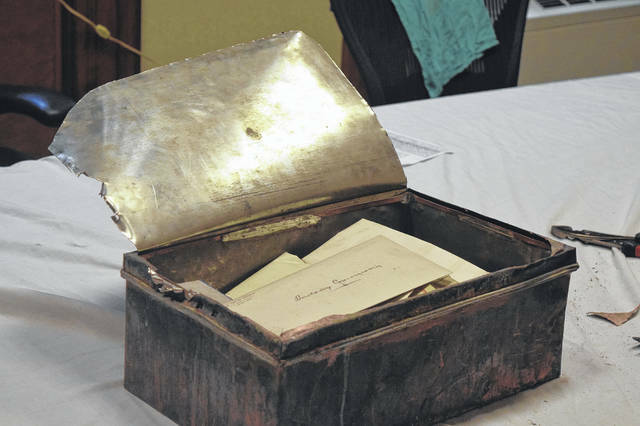 EATON — A corner of the Preble County Courthouse was opened on Tuesday, July 24, and a time capsule was removed from inside. The time capsule has been there since the courthouse was built, nearly 100 years ago. This removal was one step in preparing for the upcoming Courthouse Centennial Celebration. According to Commissioner Chris Day, on March 17, 1917 the Preble Cornerstone was laid in Masonic form, according to the Masonic rites under the direction of the Grand Lodge of Ohio. The lodge formed in the line of a march on Barron Street, east to Cherry, south to Main and west of the courthouse, where the grand lodge officers took their positions on the platform. The Grand Marshal announced the purpose of the assembling of the order and the Grand Chaplain offered prayer. The Grand Treasurer, in whose custody was the sealed copper box for the stone, placed the box in position and while the cornerstone was being lowered in position, the Grand Treasurer read the list of articles contained in the copper box. It contained the history of the Preble County Courthouse as prepared by Oscar Sheppard, a list of county officers, bar and judges, the Building Commission, American flag, a copy of the Bible, a copy of the Preble County Centennial edition of the Register, published July 4, 1906, together with the current issues of the local county papers, and rosters of religious and civic organizations, the history of William Bruce, founder of Eaton, written by his granddaughter, Mrs. Laura Bruce Sayre, history of the West Alexandria Post Office; Unity Club Program; copy of the “Purple and Gold” 1917; copy of “Eaton School Journal” 1888; history of the Glander family; history of Grace Lutheran Church; list of members of St.Paul M.E.Church; history of the Church of Visitation, Director of First Presbyterian Church; directory of the First Christian Church; history of the First U.B. Church; program of the Utopian Club of West Alexandria; program of Round Table Club of West Alexandria; program of Research Club of Eaton; History of organization and list of members of the Current Events club of Eaton; list of Eaton Village officers; postcard views of Eaton; Preble County Educational Report; directory of the Eaton public schools; list of County Offices who have served during organization of Preble County; American Flag; coins, 10, 25, and 50-cent pieces dated 1917; German one-half mark; English penny; Lincoln pennies and buffalo nickels; Linotype slugs sets in Herald office of Eaton; Eaton Register of March 14, 1917; centennial edition of Eaton Herald dated July 9, 1908; woman’s edition of Eaton Register dated May 27, 1897; souvenir edition of the Eaton Herald, October 1908; Prosperity Edition of the Eaton Herald, November 1, 1916; pillar edition of the Eaton Democrat, October 26, 1916, Eaton Democrat, March 15, 1917; Eldorado Bee, March 15, 1917; Twin Valley Echo, March 15, 1917; Lewisburg Leader, March 15, 1917; Preble County News, March 15, 1917; New Paris Mirror, March 15, 1917; Eaton Herald, March 14, 1917; The Gospel Messenger, March 17, 1917; Eaton Telephone Director; Statistics Eaton National Bank; Dayton Journal, March 17, 1917; Cincinnati Commercial Tribune, March 17, 1917; Cincinnati Enquirer, March 17, 1917; Green Flag, emblem of St.Patrick’s Day; list of members of Eaton Commercial Club; picture of the columns of the courthouse after building was torn down; organization of Preble County National Bank; key to Probate Office of the old courthouse; premium list of the Preble County Agricultural Society, 1916; souvenir badges of Preble County Centennial, 1908; list of architects and contractors for new courthouse; appointment of building commission for the new courthouse. On Tuesday, July 24, the same copper box was removed from the Preble County Courthouse cornerstone which was laid on March 17, 1917, and was opened. According to Commissioner Day, Houston Brothers of Cincinnati, was in charge of removing the stone to expose the time capsule and it took approximately four hours to do so. The spot where the box was removed is still open, so all can see where the piece of history lay for years. Preble County Commissioners are currently collecting items to be placed in the 2018 time capsule. 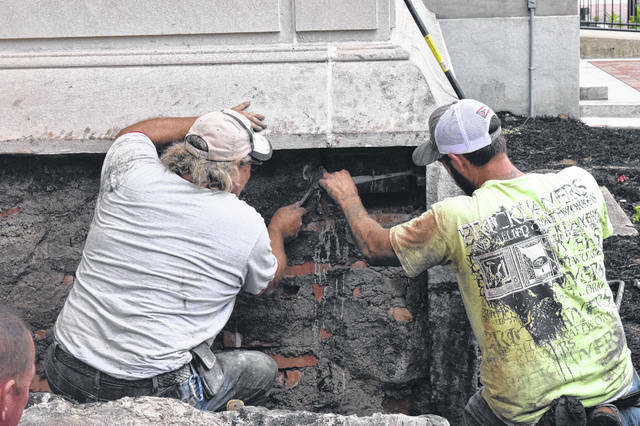 The capsule will be replaced during a ceremony on Sunday, Oct. 6.
https://www.registerherald.com/wp-content/uploads/sites/41/2018/08/web1_Time1.jpgA corner of the Preble County Courthouse was opened on Tuesday, July 24, and a time capsule was removed from inside. That time capsule has been there since the courthouse was built, nearly 100 years ago. New items will be placed inside and the capsule will be replaced during a ceremony on Sunday, Oct. 6.